Cook your rice as per directions on the pack, (boiling for 25 minutes) and then allow to drain well and set aside. While that’s cooking, get a start on the rest of the dish. Heat 1 tbsp. of the oil in a large wok/fry pan over a medium to high heat. Cook the chicken in 2 batches until browned, just cooked, and set aside. Add the bacon to the wok and fry until crispy. About 3 minutes. Set it aside in the bowl with the cooked chicken. Heat another tablespoon of oil and gently scramble the well beaten eggs until just cooked. Set them aside in a small bowl. Heat another tablespoon of oil in the wok and fry the garlic, chilli, and ½ of the spring onion only for about 30 seconds before adding the carrot and celery. Fry for 3 minutes. Return the chicken and bacon to the wok, adding prawns and cabbage and cook for about 2 minutes or until the cabbage wilts. Add the cooked brown rice, bean sprouts and Braggs Seasoning. Stir-fry until all ingredients are warmed through, adding the eggs at the very end. 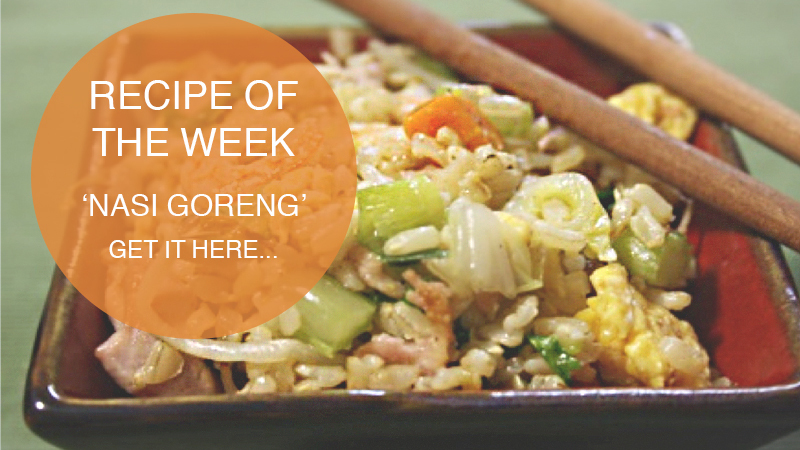 Using brown rice gives this a slightly nuttier flavour and a healthier alternative to white rice. Do try and add a little chilli, even if you think your family can’t take the heat. It really adds to the flavour. Just use a little less. As with any stir fry, getting in and chopping all the vegetables at the start is the key to making this work easily, and in just over ½ an hour. Serves 4-5 people with left overs for lunch the next day.